Believe it or not but men of Catholic faith do say the Rosary. They seek peace and comfort in a prayer on a daily basis. Men can be as dedicated and devoted to the Blessed Mary just as the women can be. Of course, guys prefer more masculine, larger rosaries with beads bigger than 6mm. They also look for neutral colors like black or brown. Rosaries made of wood with beads strung on a cord seem to be the best since they are durable and last longer. 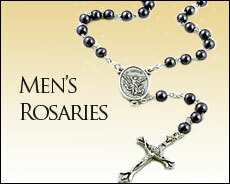 We have assembled a great selection of rosaries for men in this collection. Buy a rosary for a special guy in your life and let him discover mysteries of the Holy Rosary. Choose from wood, glass or metal beads mounted on a cord or chain. There are hundreds of hematite bead rosaries for men in our patron saint rosary catalog we just added. Be sure to visit it here. These rosaries come with a patron saint silver plated centerpiece and arrive in a nice gift box. Made in the USA by Bliss, each comes with a Lifetime Warranty for an added piece of mind. Below are a few examples of these rosaries.